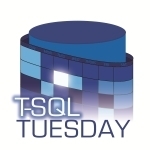 So it’s T-SQL Tuesday time again and this month it’s hosted by Jes Schultz Borland. But this month, I want to tell you about the aggregate function PRODUCT(). I don’t know the first person who came up with this trick (Most likely Napier). With a quick search, I understand that others have written about its implementation in SQL many times before. 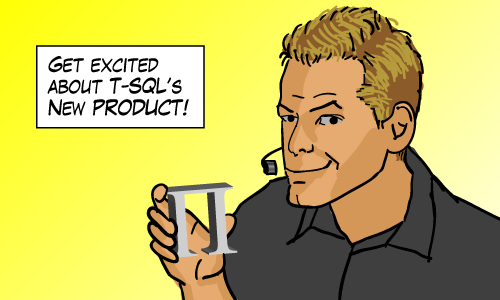 In fact, I wouldn’t be surprised if this tip comes up again this T-SQL Tuesday. But I post anyway because I like my examples and had fun writing it. All good though – it's nice to be reminded of this stuff. I left the mention of zeroes and negatives to keen commenters like yourself. Lightning Fast Hybrid RUNNING TOTAL – Can you slow it down? Thanks for the link. It’s interesting that it got mentioned by my friend Brad Shulz in that thread. In my post I linked to a google search above (and fixed the link just now). I was pointing to the search http://www.google.com/search?q=%2B%22EXP+SUM+LOG%22+%2Bsql which shows thousands of people who have discovered this before I did. C’est la vie. Cool stuff, Michael. Thanks for sharing! This seems unreliable if you want to work in the domain of ints. See http://stackoverflow.com/questions/31343533/update-with-non-clr-product-aggregate-results-in-off-by-one. The problem is that LOG and EXP work with floats and so we get the “usual” issues of floating point rounding. That’s actually pretty surprising Damien. Thanks for the link. 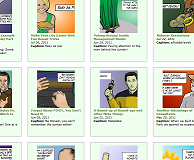 I was never super-proud of this article… I may update it or take it down altogether. Throwing away a method because it occasionally gives you a result which is out by a tiny fraction is not a reason to throw out the method, but to take more care about casting as an integer. I’m sure with not too much trouble you could find an example of multiplying an integer by a float, and getting a result which is X-0.0000000000001 instead of just X, such that if you cast that as an integer it will round down. When dealing with floats and ints it is important to ROUND instead of CAST. This method of PRODUCT is just fine. It’s the handling of data types that has caused the stackoverflow question. You’re right Rob, but this PRODUCT trick is just not super-important (to me personally). I’ve never used it or needed to use it except as an exercise in aggregates. I’d be interested to hear about real-world examples which make use of this PRODUCT method. I agree that PRODUCT() is a rare thing, but there are legitimate uses for it in heavier maths, such as when dealing with vector multiplication using matrices… Probably not necessarily something you’d do in SQL, but that depends on your sources and other stuff. Right. That’s my experience, that there’s rarely an overlap between heavy math and things one does in SQL. I had a reason for this. I have a Product Structure Table where I wanted to roll up the quantities of several parent child entries. You need to multiply the quantity times the parent quantity times the grandparent quantity times the great grand parent quantity….etc. I was able to get all the parents at all levels with one query. Then, I have local quantity of each row. Now, condense them at get the product. This will break with zeros however.